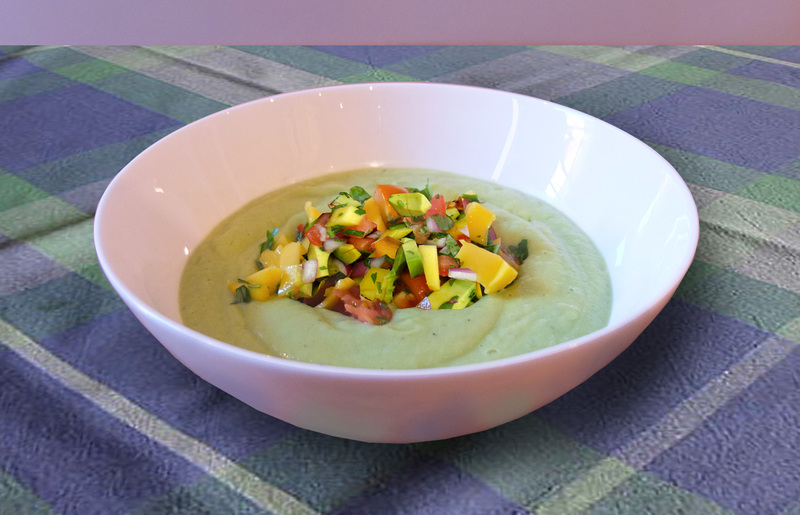 A few days back, I came across this fantastic recipe on Pinterest for Chilled Cucumber and Avocado Soup with Mango Salsa by Gena Hamshaw. I love the chilled soups that come into season with the warmer months — gazpacho soup has long been a favorite of mine, ever since I saw the film, Women on the Verge of a Nervous Breakdown, by Pedro Almodóvar (a very funny Spanish film that also stars a young Antonio Banderas in a supporting part). This cucumber avocado soup is a combo of flavors and colors that seems like a no-brainer. I modified the recipe some because I like a somewhat creamier aspect and because I’m trying to include more protein with meals for me and my family, even when the meal is vegetarian, and calcium source are a plus for me as well. To this end, I add in some Greek yogurt and a dollop of sour cream.